In many ways, the Light Vault House is a challenging piece of architecture. It sits on an exposed street corner in the Melbourne suburb of Brighton, its simple, brutalist form in stark contrast to the surrounding architecture. Indeed, the owners’ original brief to architect Glen Chamberlain was to recreate a ‘concrete bunker’ - not exactly a form you’d expect to sit well with the residents and planning authorities of this conservative, bayside neighbourhood. 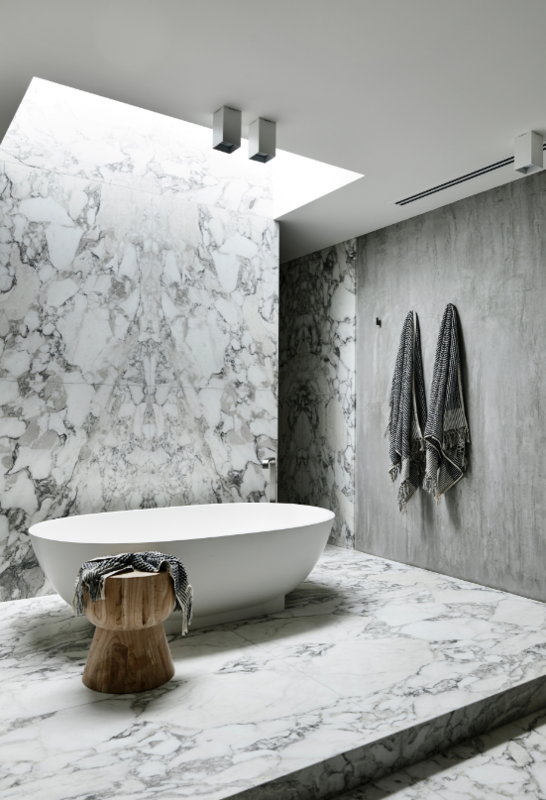 And yet the real challenge for Chamberlain and his team was not so much the exterior, but what goes on inside – how to introduce light, how to create a natural flow and transition, and - most importantly – how to ensure function didn’t lose out to form. Indeed, the metaphor Chamberlain and his team quickly adopted for the project was that of a jewellery box – a rather austere outer form belying a treasure within. You get a taste of what’s to come from the dramatic, sculptured entrance way, the timber front door shrouded by dark, powder-coated steel. But it’s not until you step inside that you truly begin to appreciate the thoughtfulness and beauty of this design. 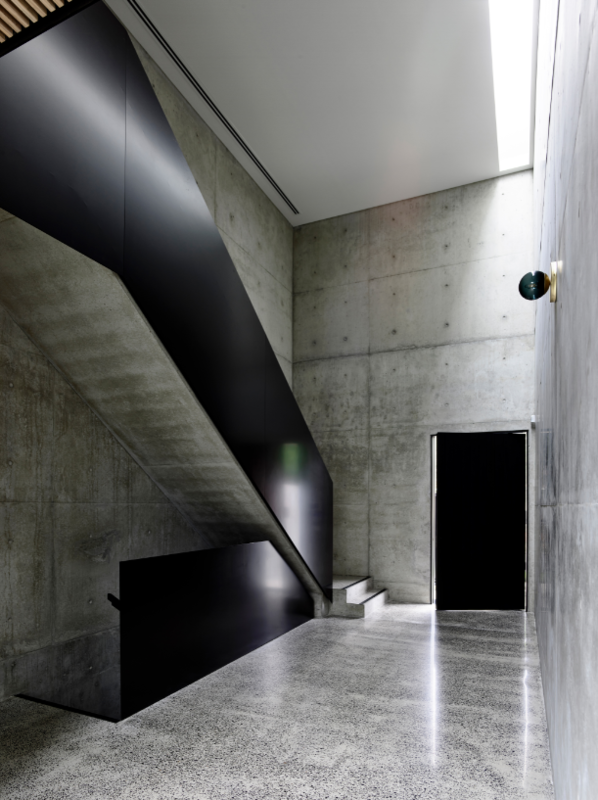 The dramatic, 6.5 metre high entrance void is all concrete - insitu, off-form walls and polished flooring, punctuated by a concrete-formed stairway that leads up to the bedroom level. 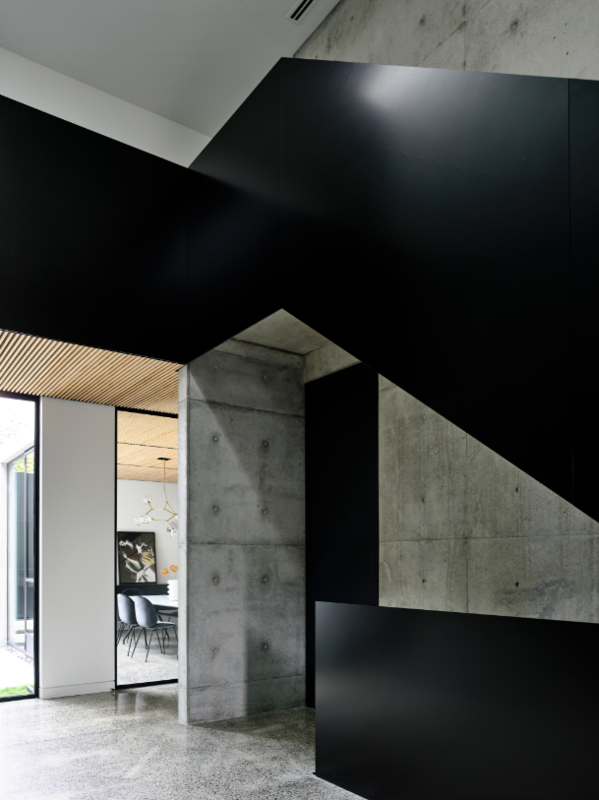 The stairs and balustrade are framed by the same black steel used around the front door. The brutality of the material is further softened as your look down and past a section of timber batten ceiling to a window-framed view of a central outside courtyard. The eye is immediately drawn to a leafy green tree – a clever juxtaposition of the built and natural environments. This planted courtyard serves not just as visual relief, but as another source of internal light. The timber batten ceiling also marks the beginning of the transition from the entranceway to the living areas. 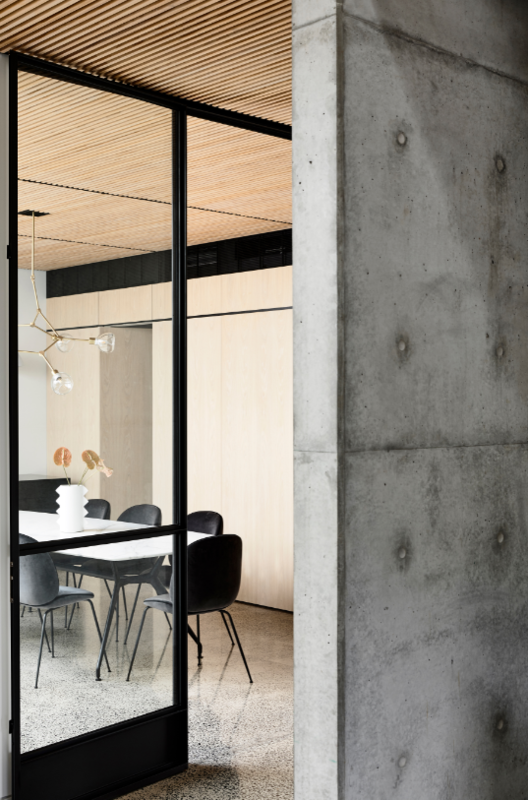 Together with the polished concrete floor, it leads you along an enclosed accessway that runs down one side of the courtyard to the rear living space, comprising kitchen, dining and family areas. The timber battens serve a dual purpose – visual contrast and noise dampening. “In the double height entry void the acoustics are quite resonant, adding to the drama of the space,” Chamberlain says. 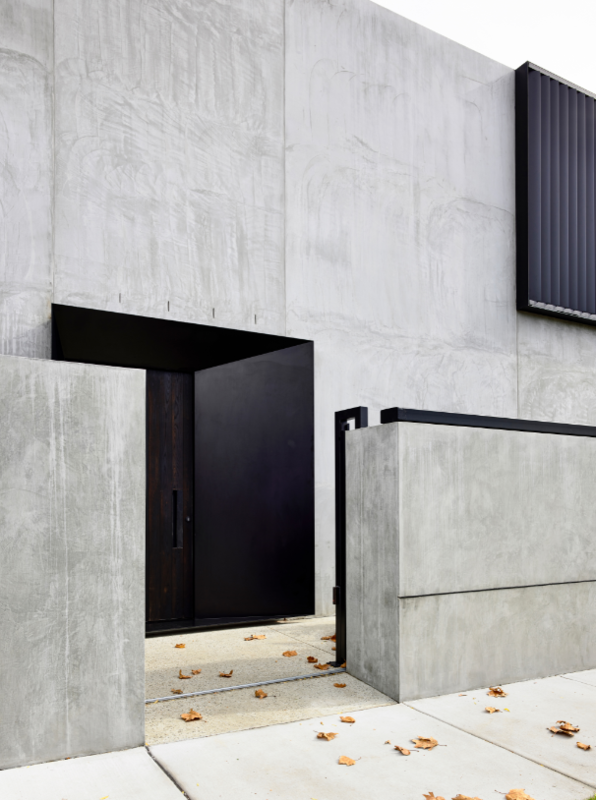 On the outside of the home, Chamberlain and his team have been able to deliver the same monolithic impact of insitu concrete by using concrete blockwork finished in a smooth-set cement render. “Most people don’t realise it’s rendered blockwork. 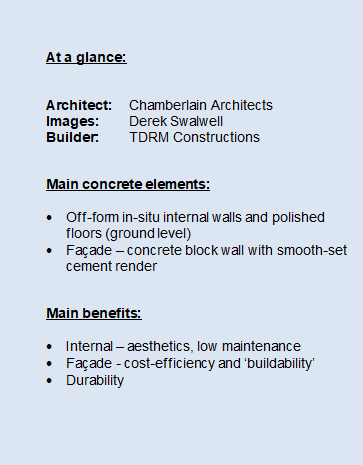 It’s still concrete walling, just a different type,” Chamberlain says. Chamberlain says much of the beauty of the Light Vault House stems from the use of a limited palette of materials. 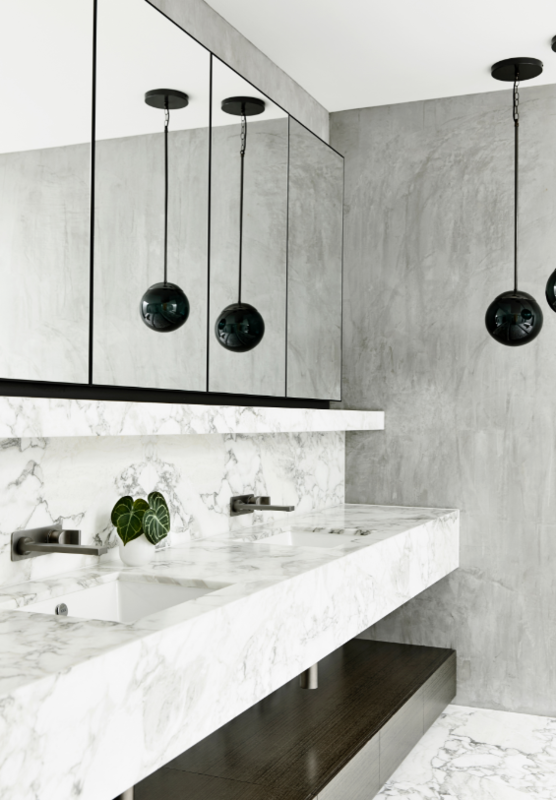 “Elementally, its three materials - concrete, steel and timber. For us, it’s always about how can we wind things back and use less,” he says. It’s a simple philosophy, but one that is perfectly expressed in this project.